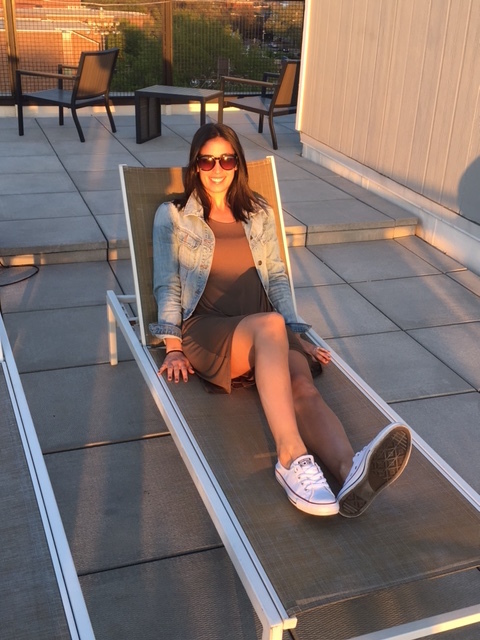 Warm weather has evaded me most of this month but yesterday I soaked up every little bit of sunshine that I could! I took a walk around the neighborhood, read a magazine and took an accidental nap on my rooftop and then later watched the sunset over D.C. while lounging in my former napping chair. Living in a city with a long winter makes these days feel so amazing, people are everywhere, laying in the park, sitting at street side cafes and just enjoying life. I swear when I’m old and frail I need to be living somewhere warm, it just does so much for my soul and happiness! 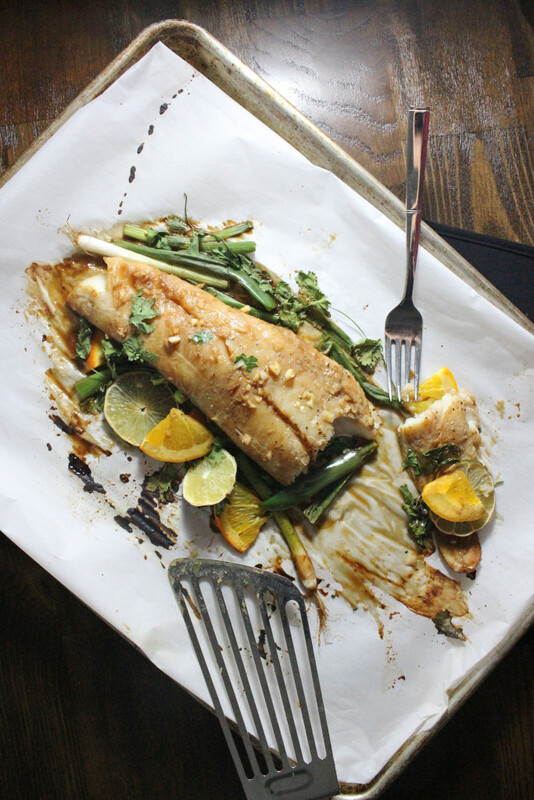 Speaking of happiness, this fish is all of my favorite things wrapped into a healthy meal that you can have on your table in less than an hour. 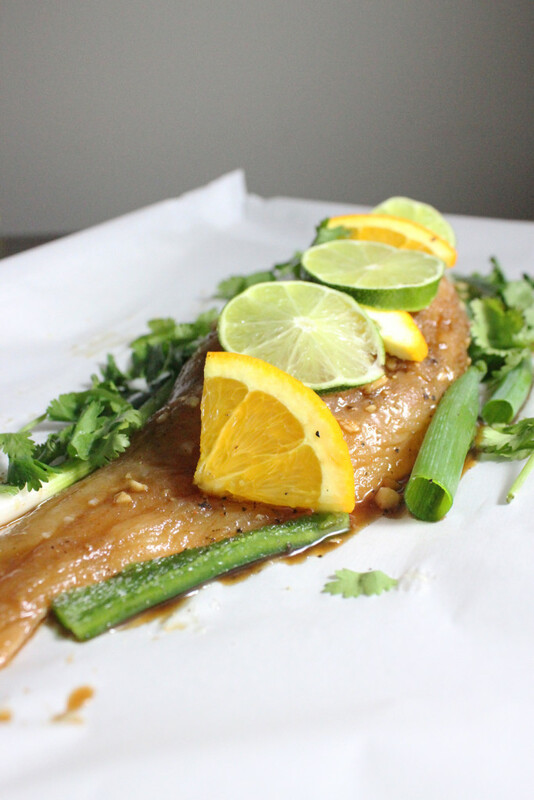 The citrus and soy sauce act as a tenderizer during the 30 minute marinating process and you also line the baking sheet with citrus so that every moment the fish is enveloped in flavor. I’ve never worked with haddock but it was wild caught and from the states so I knew it was going to be delicious. It has a flaky texture much like cod or flounder and the magic lies in the salty, citrusy, garlicky marinade. Enjoy with a side of grilled bok choy or wilted spinach. In a wide dish, whisk together all the ingredients from the garlic to the cayenne pepper. Place the sprigs of cilantro in the bowl and lay the fish in to marinate, getting the soy sauce mixture all over the fish. Marinate in the fridge for 30 minutes and preheat your oven to 350. 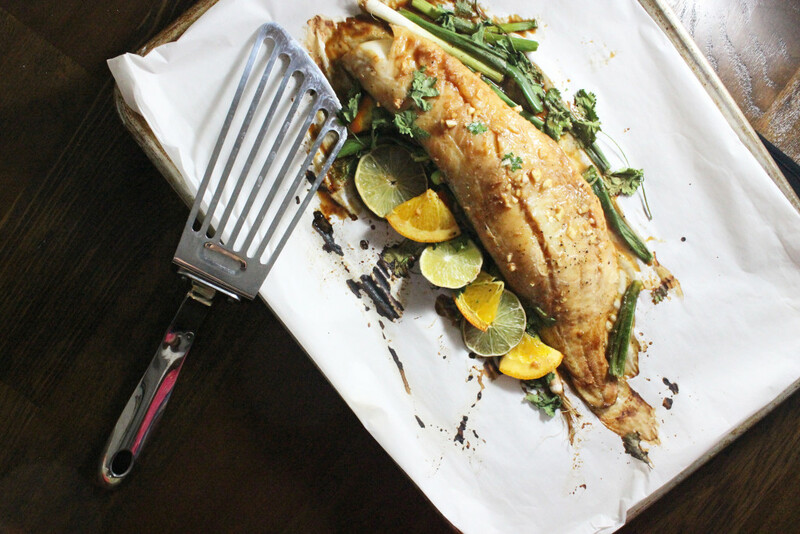 Once the fish is marinated, lay a few pieces of lime and orange on a parchment paper lined baking sheet. 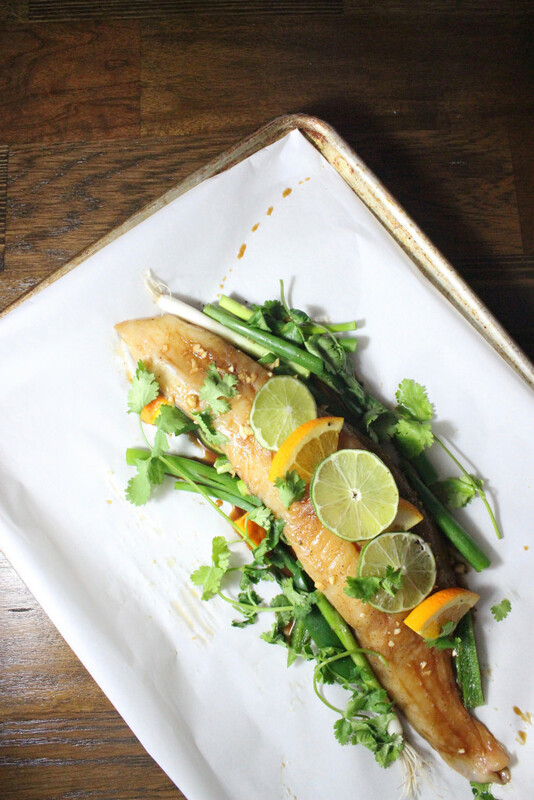 Lay the fish on top of the citrus and then arrange the green onions and additional citrus pieces around and on top of the fish. Sprinkle with salt and pepper before putting in the oven. 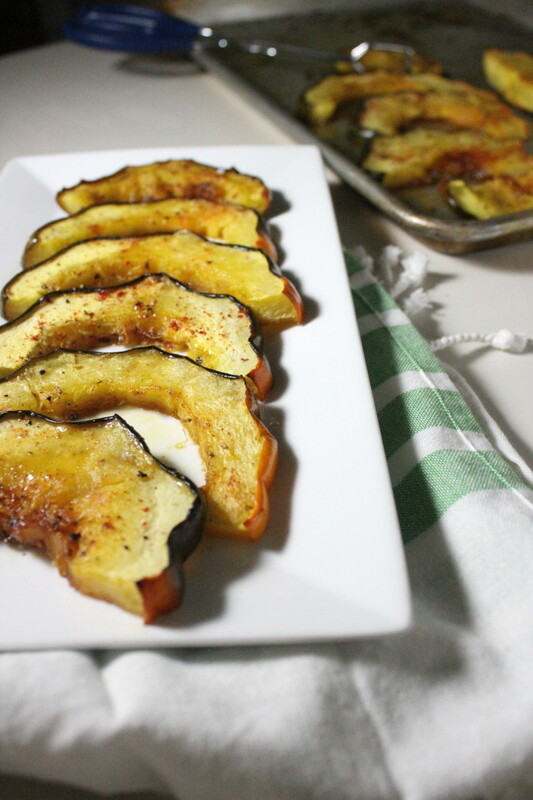 Serve with your favorite veggie and enjoy immediately! This song reminds me so much of America’s song, “Ventura Highway.” The throwback feel is a great accompaniment to a day spent relaxing outside. 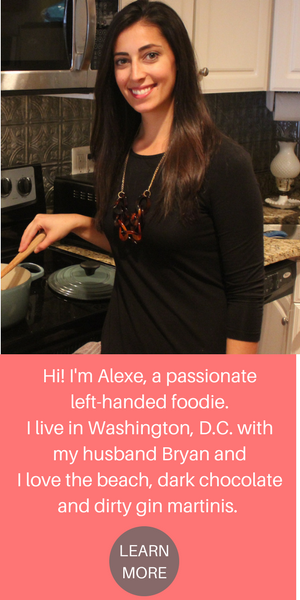 Sign up and subscribe HERE to Keys to the Cucina and receive notifications when a new post goes live!